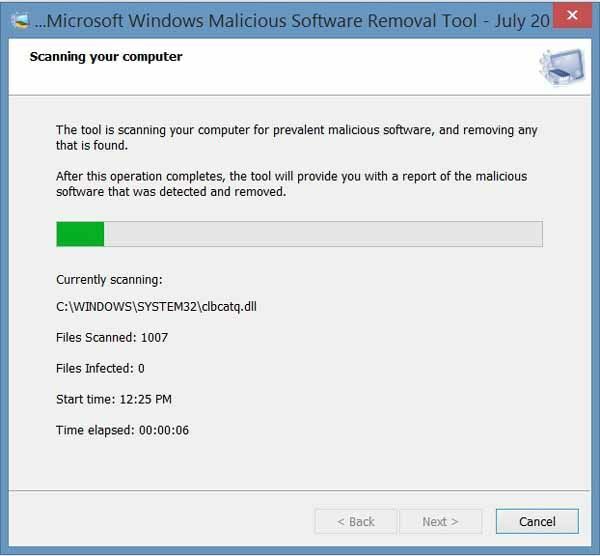 Free download Microsoft Malicious Software Removal Tool latest version. The Microsoft Malicious Software Removal Tool checks computers running Windows 7, Windows Vista, Windows XP, Windows 2000, and Windows Server 2003 for infections by specific, prevalent malicious software—including Blaster, Sasser, and Mydoom—and helps remove any infection found. When the detection and removal process is complete, the tool displays a report describing the outcome, including which, if any, malware was detected and removed. Microsoft releases an updated version of this tool on the second Tuesday of each month, and as needed to respond to security incidents. The tool is available from Microsoft Update, Windows Update and the Microsoft Download Center. Note: The version of the tool delivered by Microsoft Update and Windows Update runs in the background and then reports if a malware infection is found. To run this tool more than once a month, use the version on this web page or install the version that is available in the Download Center. Because computers can appear to function normally when infected, it’s a good idea to run this tool regularly even if your computer seems to be fine. You should also use up-to-date antivirus software, such as Microsoft Security Essentials, to help protect your computer from other malware.